Because change is inevitable, organizations clinging to old ways of leadership and management will not continue to prosper for long. People and organizations change slowly, usually with great resistance and often with considerable pain. Since 1966, LMI has helped thousands of leaders and organizations worldwide make the changes required to be competitive in a challenging global economy. Developing effective leaders and improving organizational performance is our passion...and our business. 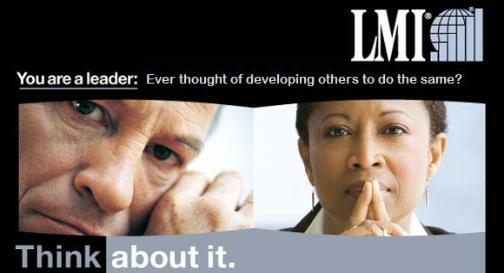 A career with LMI can be rewarding both personally and financially. To find out more, click on "Leading Leaders"